Review: "Le Grand Baton: Le Grand Baton" - Sea of Tranquility - The Web Destination for Progressive Music! Here at the Sea, we're all about introducing eclectic new sounds to you, the adventurous listener. 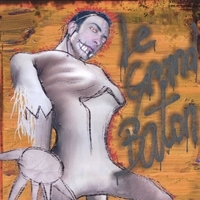 Among our latest discoveries is Le Grand Baton � a percussion-heavy collective with members hailing from France, the Caribbean and the United States with a sound revolving around the Ka drum. That particular instrument, popular in Saint Lucian folk music, is played on the ground rather than upright, giving it an altogether distinct sound. Many members of this self-proclaimed "voodoo rock band" play it on Le Grand Baton, infusing 15 Creole-sung songs with a rhythmic sensibility that will rattle your ears and shake your brain. The drums, combined with electric guitar and the strong, often-falsetto voice of Jean-Christophe Maillard, listed in the credits as Mbutu (Creole for "drumstick"), deliver a universal message � one in which polyrhythmic pulses and righteous riffs trump language barriers. Think King Crimson gone tribal, or a more kinetic Peter Gabriel, or maybe a less frenetic System of a Down. The brief spoken-word passages can be annoying, and at times you might feel completely lost if you're unable to get to the same headspace as these guys. But lost in a good way, as you let the ethno-prog sounds of Le Grand Baton transport you to another place and time.